The Army Tactical Missile System (Army TACMS) resulted from a need to engage high priority targets at ranges beyond those of existing weapons. The Army TACMS Block I replaces the conventional Lance system. Block I is a ground launched, deep fires missile system consisting of a surface-to-surface guided missile with an anti-personnel/anti-materiel (APAM) warhead consisting of approximately 950 M-74 bomblets. The missiles are fired from the Multiple Launch Rocket System (MLRS) modified M270 launcher. The missiles are deployed within the ammunition loads of corps MLRS battalions and/or division artillery batteries. The Army TACMS includes guided missile and launching assembly, test set, guided missile system, training set, guided missile system: M165, trainer, test device guided missile: M70, modified M270 launcher, and Army TACMS missiles facilities. The Army TACMS Block I is a semi-ballistic missile with an APAM warhead that contains approximately 930 M-74 bomblets. 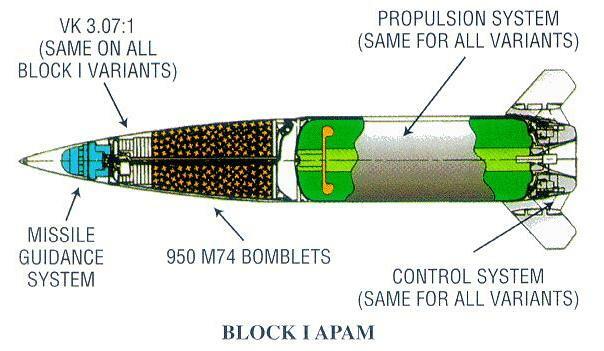 There is 1 missile per guided missile and launching assembly and 2 missiles per launcher load. The missile will engage targets throughout the corps area of influence and is designed to destroy tactical missile launchers, suppress air defense, counter Command, Control, and Communications (C3) complexes and disrupt logistics. Provides deep fires in support of deep attack/precision strike operations. The Army TACMS Block I missile underwent IOT&E in 1990. The most significant deficiency noted in the DOT&E BLRIP report that followed the IOT&E was that the Army did not demonstrate the ability to conduct target acquisition at the Block I engagement ranges. However, DOT&E assessed the system to be operationally effective, and the system entered full-rate production. Army TACMS Block I was deployed and fired in Operation Desert Storm.